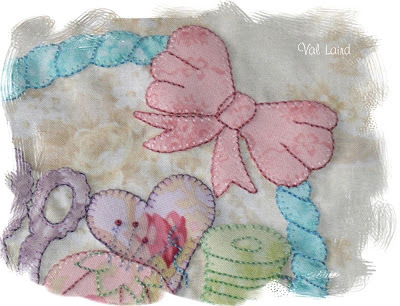 Val Laird Designs - Journey of a Stitcher: A place for everything ... and everything in its place! A place for everything ... and everything in its place! I have a tidy house! Can't help myself - There's a place for everything and I like everything in its place. 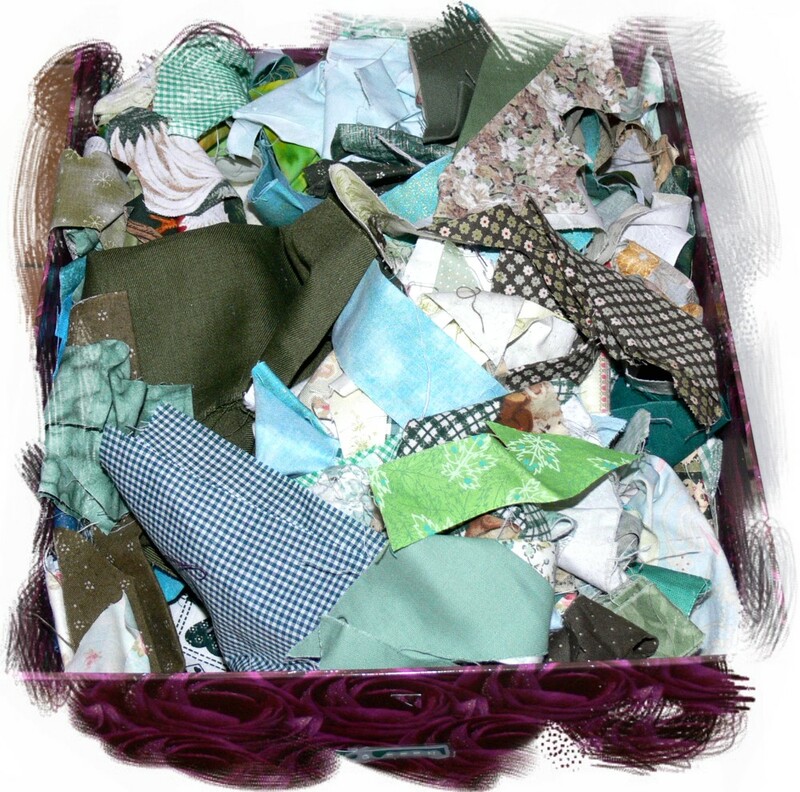 However, I do have to confess that sometimes my sewing room doesn't quite make it! Oh yes, there IS a place for each little item. 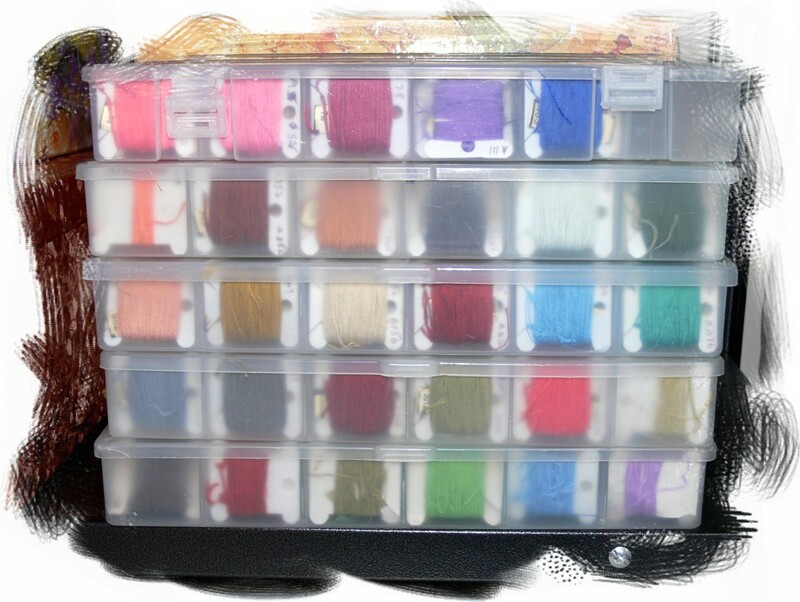 My embroidery threads are all in correct order in these containers. 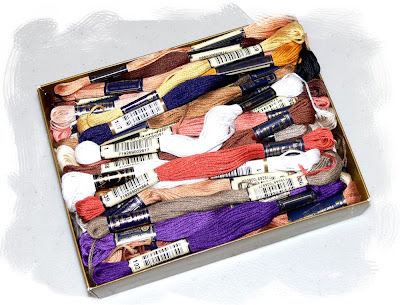 For years now, I have had a complete set of Anchor Stranded threads - yep, every colour. As soon as a colour is about to run out, I purchase another. I even have spares of the colours I use lots of, ready in the drawer. There's nothing worse than running out in the middle of a project and when you live a long way from the shops and might have to wait a month before you can get there, it pays to be organised! 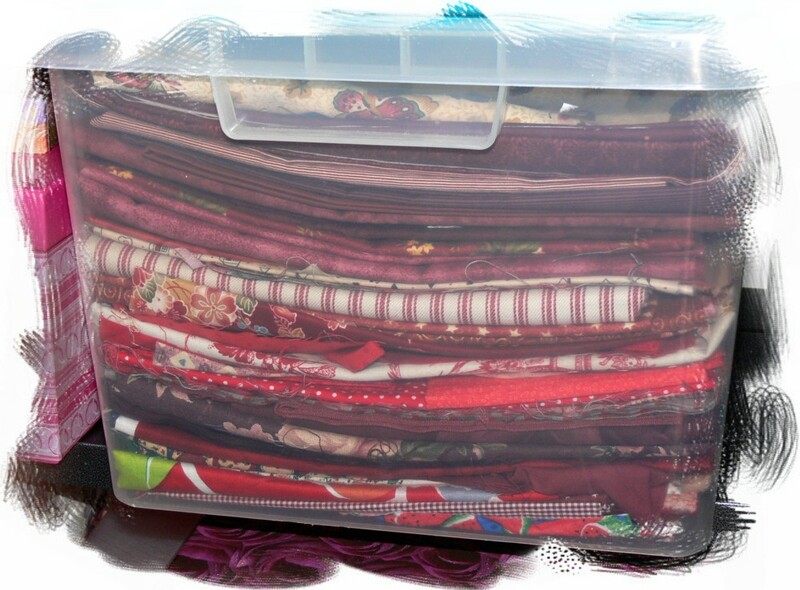 My fabrics are in clear crates so that I can see at a glance what I might be looking for. Scraps are in their own little box. I used to fold them all neatly too, but gave up on that idea as I was always rummaging through looking for just the right fabric for an applique or two. So now they all just get pushed in and I up-end the box onto a table to do a search! Charms and embellishments have their own containers too. It is SMALL - on purpose. 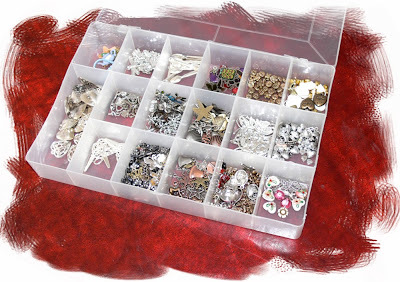 I find it is just big enough to hold the bits and pieces until I decide to put everything away, but it is small enough that it won't hold much, so I can't accumulate. In reality, the putting-away job that I put off doing, usually only takes a couple of minutes, but there's something about human nature that procrastinates, isn't there! 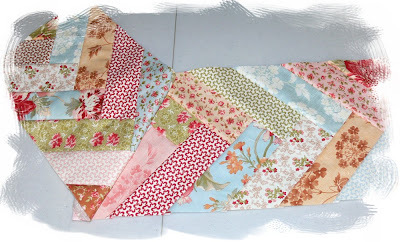 It's going to be a table runner. Now I have 84 applique pieces to make! We're going on holidays in a couple of weeks so I'm thinking needleturning all these pieces will be a good project to take along with me when I feel like a change from my crochet ripple blanket. My TV time was spent finishing this applique design - couldn't bear to watch TV without some stitching in my hand. 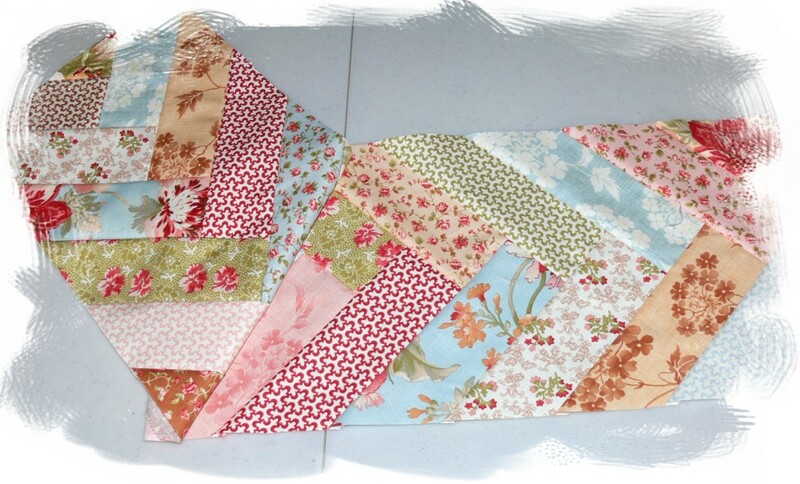 I love being curled up under a quilt on my recliner, making pretty things! It's the highlight of my day! With another bleak and cold day upon us, being curled up under a quilt sounds like a great option! You are so busy Val! What a tidy stitcher you are. I agree that it is good when everything is in its place but eventually my sewing room looks like a tip no matter how hard I try. 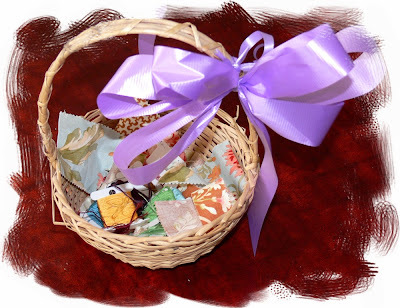 I have a basket on my coffee table where I throw things in as I stitch on the couch. Then all I have to do is sort the stuff out from there. I love that applique. Oh Val, you and I would be so at home in each other's sewing rooms! I love being organised too. The braids look lovely - something I am going to try myself tomorrow. I like to be organised like that too - my threads are all in order in boxes and my fabrics are colour sorted - and I too have a "hold all" where I put stuff I cant be bothered putting away for now. But I am sure your place is a LOT tidier than mine! I love your organization! Can hardly wait to see what the appliques are for the runner. My mother used to say that all the time - a place for everything and everything in its place. It's how she lived and she expected us, too, also. But I don't! AND I'm envying you the cold weather. I'm starting to appreciate winter more now that I live in a humid climate. Hi Val. We're in our new house now. We've had so much rain since we arrived that it's been good for keeping me indoors and unpacking. 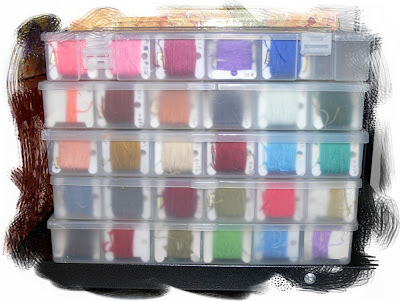 Today I began to organize my sewing room, but it's going to take several long days to make it look nice. Even then, I think I need to buy some cabinets. I'm so looking forward to being organized, just as a you are. It's a great feeling, isn't it? Hi! Looks like you and I have the same sort of theory on materials organization.=) I recently posted on sorting out some of mine. Well, moving into a couple of nice sets of clear drawers.